Makeup Setting Spray 3.0 oz. 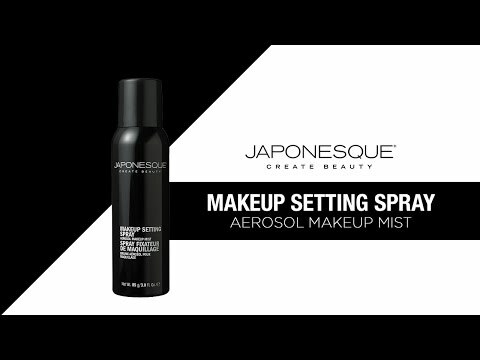 As the final step in your makeup application, the JAPONESQUE® Makeup Setting Spray prevents fading and makeup transfer to sustain a freshly applied appearance throughout the day. This aerosol formula contains transparent, non-drying fixatives that absorbs immediately and imparts maximum staying power to your masterpiece under all conditions. Contains aloe which is known to tame the appearance of dry or irritated skin by reducing flaking and restoring suppleness. After applying makeup and with eyes closed, hold the spray 8-10 inches away and mist evenly over face. WATER/AQUA/EAU, NITROGEN, ALCOHOL DENAT., PVP, POLOXAMER 407, DIMETHICONE PEG-7 PHOSPHATE, PPG-3 BENZYLETHER MYRISTATE, GLYCERETH-5 LACTATE, CAPRYLYL GLYCOL, PHENOXYETHANOL, POTASSIUM SORBATE, HEXYLENE GLYCOL, ALOE BARBADENSIS LEAF JUICE, FRAGRANCE/PARFUM. Makeup Setting Spray 3.0 oz. is rated 5.0 out of 5 by 1. Rated 5 out of 5 by MeganKaufman from Make Up Setting Spray This is fantastic!!!! My make up stays in place after using the setting spray!!! !